Announcing the winners of the 22nd ever Right Place Photo Caption Contest! First of all, I would like to thank everyone who helped make this our most successful Photo Caption Contest yet! Make sure you read the comments from the original section, as there are far too many good ones to mention them all here (though I like to think I hit the highlights)! Second, I would like to state, for the record, that I was unaware of either the much earlier contest at Wizbang! which featured a different, but very similar picture (it dates back to March - well before I followed caption contests closely) or the concurrent contest at GOP and College which featured the same exact photo! The only reason I know about the former is due to Wizbang's own Jay Tea leaving us a link in the comments during the contest (thanks, actually) - be sure to check it out, many, many more fun captions! The only reason I know about the latter is due to a link I found to it on IMAO after I had posted my own. It, too, has some great captions, be sure to check it out as well! Of course, it is still a happy accident that I never knew anybody else was using this picture, as it is a true gem and the responses are wonderful, so I am glad I can claim ignorance and actually went ahead and used it after all! Wait! Some bonus awards first! The voices in Dean's head hold their weekly weenie roast. Every time a bell rings, a moonbat gets his wings. "The new phone book's here! The new phone book's here! This is the kind of spontaneous publicity I need! My name in print! That really makes somebody! Things are going to start happening to me now!" #20: Howard Dean, wearing his signature Bad Idea Jeans, explained, "Normally I wear protection, but then I thought, 'When am I gonna make it back to Haiti?'" 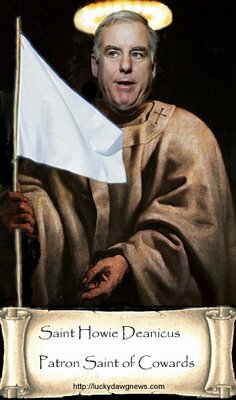 #19: Then he did raise on high the Holy Hand Grenade of Antioch, saying, "Bless this, oh Lord, that with it Thou mayest blow Thine enemies to tiny bits, in Thy mercy." #18: The lights are on but is anyone home? #17: One speech on Iraq was enough to convince Johnny Storm that he had discovered Dr. Doom's secret identity. "Flame on!" 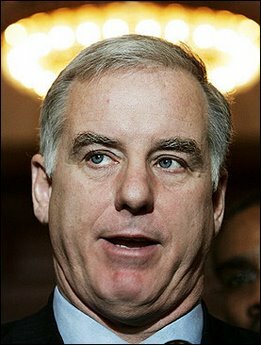 #15: As Einstein had anticipated, the space-time continuum was ripped open, and the 'Good Howard Dean' stepped through the warp just in time to save the Democratic Party from the 'Bad Howard Dean': "The President is doing the right thing, and we need to stay in Iraq and finish the job!" #14: "Thanks, Al. My pilot light hasn't been working since Andrew Sullivan blew in my ear." #13: Photographic evidence proves the theory that Dean's head really did explode back in New Hampshire. Luckily for the DNC, no one noticed. #12: Caught on film: Dean having another (bad) idea. #11: The recipe for idiotic statements requires that the brain first be preheated to 350 degrees. #10: The tiny flying saucer, finding no evidence of intelligent life, flies away. #9: Rove's top secret brain control device continues to prove its value. #8: Close Encounters of the Moonbat Kind. #7: "You want me to turn around because The Mothership is right behind me? Really, Mr. Farrakhan, how stupid do you think I am?" #5: Dubya: "So... Howie's an angel? We'll see how he feels with the White House Christmas Tree shoved up his..."
#4: "... And then me and the rest of the Heaven's Gate Cult are gonna go to Mars... and Venus... and Saturn... and Neptune... and Pluto... and we're going to Alpha Centauri... and then we're going to The Crab Nebula to take back the Great Attractor! Yeeearrrrgh!!!" #3: "Thanks for that question. 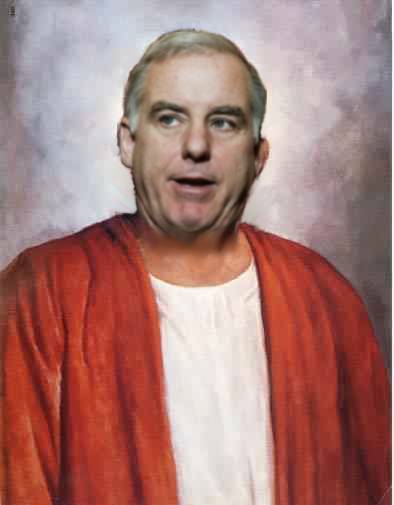 Yes, I do kinda see myself as the savior of the Democratic Party." #2: In a yearly tradition, Howard Dean's head lice turn on their holiday lights. #1: Howard hated the Iraq War! The whole Iraq War reason! Now, please don't ask why. We all know its treason. It could be, perhaps, that his mouth was a blight. BONUS! Two, yes two photoshop awards this week! Bravo! Bravo! Take a bow, everyone!